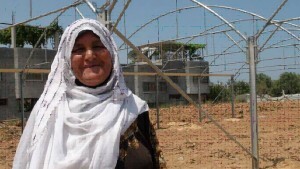 USAID West Bank and Gaza recently delivered and installed the first set of greenhouses to residents in the Gaza strip. The greenhouses are helping compensate for the ongoing shortage of fresh vegetables and produce in the region. They are also helping residents by providing extra income. Mariam Mohammad Abu Jarad during greenhouse installation Photo Credit: Jamila Al Za’anin, Save the Children Gaza. Many residents like Abu Jarad have struggled to make ends meet, but with the installation of the new USAID greenhouses, she and her family will benefit from access to more regular income and better sustenance. Through the EDIP project, USAID has installed 86 greenhouses in Gaza. Excellent items from you, man. I’ve take into account your stuff previous to and you are just extremely fantastic. I actually like what you’ve received here, really like what you are stating and the way by which you are saying it. You make it enjoyable and you continue to take care of to keep it wise. I can’t wait to read much more from you. That is really a tremendous site. These greenhouses seem like a great idea by USAID. They are not only providing aid for families in need of nutrition and income, but are allowing the families to have hands-on control of what to grow and how which preserves some of their independence. USAID is encouraging local Gaza resident to maintain a strong work ethic by helping locals back to their livelihood in agriculture by providing the materials needed. USAID is helping them get a start, but much is left to the farmers themselves to actually make the change happen. These greenhouses will bring about many positive changes in communities to which they are given. More fresh produce will be available and in greater variety. This change will bring about better nutrition and sustenance for all in the community. Where nutrition improves, the quality of life improves. With an increase in the quality of life, the general happiness and well-being of the entire community improves. This project is a great move by USAID. Thanks for information, its helpfully for me. And it would be great if USAID intall greenhouse in my place, in papua. thanks for sharing information.